Diabetes. Cardiovascular disease. Depression. These are the effects you typically see associated with stress. While it can cause disease, stress is also good for you. It's part of important cognitive and physiological functions that extend far beyond keeping us alive in "fight or flight" scenarios. The question, then, is how we can use stress to our advantage. We have to maintain it at levels that allow us to reap its benefits, without crossing over into unhealthy territory. Let's get one thing clear right off the bat: stress is not only an unavoidable aspect of life, it's also an indispensable one. Stress, by definition, is triggered by an adverse situation or condition. It's your body's way of letting you know that you need to escape or overcome a situation. Here's the classic example: you're crossing a busy intersection when you suddenly realize there's a seven-ton bus hurtling directly at you. You need to clear out. Now. In this situation, you experience what researchers call an acute stress response. Your body is flooded with catecholamines and glucocorticoids, two molecular classes that encompass well-known "fight-or-flight" hormones like epinephrine (aka adrenaline) and cortisol, respectively. These hormones have a strong and immediate effect on your physiology: your breathing quickens and your heart throbs frantically, delivering more oxygen to your body's organs; your pupils dilate, helping make you more alert and aware of your surroundings; and energy is unleashed for immediate access by your muscles. I have a colleague who gets money from the Department of Defense to try to improve stress resistance (for obvious reasons). So [my colleague] went through a selective breeding process in mice, choosing specific features and amplifying them in certain populations, and came up with a "stress resistant mouse." What that mouse displayed was an inability to mount an adrenal glucocorticoid response. Now, is that really a stress-resistant animal? I would argue that it isn't, because in the presence of a stressor, these mice lacked the physiological mechanisms necessary to respond appropriately to a threat. Fine, you're thinking. So I need stress for dodging trains, or outrunning my fellow campers when being pursued by a bear, but situations like these are rare — so just how necessary is stress, really? You're right — the threats that we encounter in our daily lives are not typically of the life-or-death variety. But your body's stress response can benefit you in ways that don't necessarily involve getting you out of the way of an oncoming bus; in moderation, stress can be cognitively and physiologically advantageous in other ways. Fleshner says that in short bursts, the acute stress response "actually kicks off a beautiful priming effect that can strengthen your immune system, allowing it to respond more quickly and efficiently against disease." Moderate levels of stress in a work environment can even give rise to states of beneficial psychological and physiological arousal, helping you focus on completing a project before a deadline, for example, or enhancing your memory. Patients who experience moderate levels of stress before surgery have even been shown to recover more quickly than those who experienced low or high levels. In the end, stress is more to your body than an emergency response system; it can actually help reinforce your health and well-being. The catch, of course, is that in order to reap the benefits of stress, your body must be capable of regulating its effects. It's when stress becomes overwhelming — be it due to intensity, duration, or both — that it become detrimental to your cognitive and physiological well-being. Two examples of this are post-traumatic stress disorder (PTSD) and chronic stress. 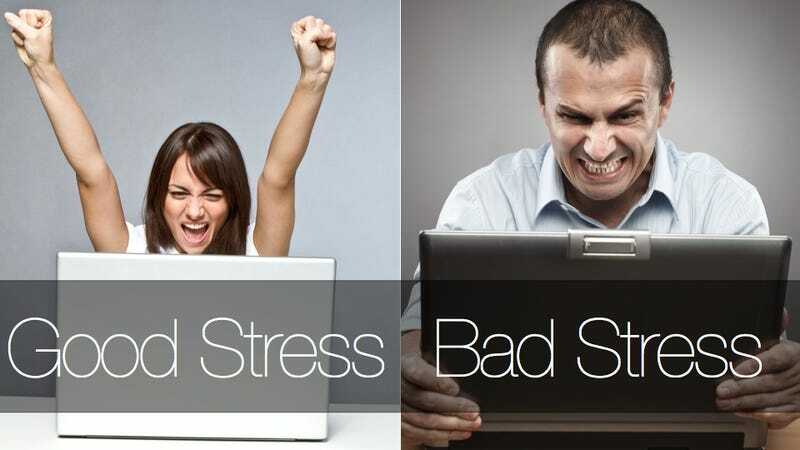 We'll deal with the latter, since that is the form of stress that most of us encounter in our daily lives. For example, you'll start to see a decoupling between heart rate and blood pressure, so that the animals that are repeatedly exposed to stress will start to maintain high blood pressure even at low heart rates. This is a sign that their vasculature is beginning to stiffen, and is indicative of the onset of cardiovascular problems. You also see a shift in activity throughout neural circuits associated with stress. In humans, stress crossing over the tipping point is associated with a greater risk of depression, diabetes, upper respiratory infections, autoimmune diseases, and even undermine your body's ability to heal after an injury. In a study published in this week's Proceedings of the National Academy of Sciences, researchers at Carnegie Melon actually demonstrated that chronic stress impairs your body's ability to regulate levels of cortisol (which, you'll recall, is one of the hormones your body releases under stressful situations); this, in turn, has a direct effect on your body's ability to mount an immune response, making you more susceptible to illness and infection. The million-dollar-question, then, is how to to avoid stepping over the threshold that separates good stress from bad stress. There are two good ways to approach this . The first is to learn how to cope with stress that you may already be experiencing. There are a number of ways to go about doing this. One is to learn to recognize and avoid daily situations that you know will cause you undue tension, pressure, and anxiety. This source of stress could manifest itself in the form of a person (friend, family member, co-worker), a place (the mall on Friday night), or even a time of day (rush hour). Relaxation techniques like meditation and deep breathing have also been shown to relieve symptoms of chronic stress. Even something as simple as telling yourself that your stress can work to your advantage has been shown to have a significant physiological and cognitive benefits; it may sound new-agey and hokey, but a number of recent studies have shown that people who are coached to believe that feeling stressed before the GRE or an oral presentation can improve their performance not only outperform those who aren't, they actually exhibit significant physiological improvements, as well, including increased cardiac efficiency and lower vascular resistance. But the second, and arguably better, way to improve your capacity for benefitting from stress is something you should really be doing, anyway, and that's exercise. Better yet, make that regular exercise. Triggering your physiological stress response on a regular basis is actually essential for healthy adaptations to stress. One of the best ways to do this is through exercise. If you go for a run, you turn on a lot of the same responses that you see during periods of stress: your heart rate increases, you release glucocorticoids for energy utilization, the list goes on. When you turn on that response repeatedly by exercising every day, your body becomes better and better at regulating your response to stress. The better your body is at handling stress, the easier it is to act decisively when you're under pressure, whether you're dodging a car, dealing with a heavy courseload, or staring down deadlines at work. The greatest benefit of all, however, is that by exercising, you're actually training your body to respond to stress in a more appropriate and timely manner. Just look at Mr. Ridiculously Photogenic Running Guy, here. Does he look overwhelmed by stress to you? Of course he doesn't. "If you don't exercise your stress response, it's not only more likely to be triggered by inconsequential stimuli, it actually becomes harder to turn off." And remember: not being able to flip the off switch on your stress response is what leads to chronic stress in the first place; tame your body's ability to regulate stress, and you can reap maximum rewards from your body's natural reactions to the challenges life throws at you.